This section provides instructions for configuring your course to use content experiments. To enable content experiments in your course, you add split_test to the Advanced Module List in Advanced Settings. split_test is the internal edX Platform name for a content experiment. From the Settings menu, select Advanced Settings. On the Advanced Settings page, locate Advanced Module List. In the Advanced Module List field, add "split_test". Be sure that you include the double quotation marks. If you have multiple values, ensure that they are separated by commas (,). Before you can create content experiments, you must specify at least one group configuration for your course. A group configuration defines how many groups of learners are in an experiment. You can have any number of group configurations in your course. When you create a content experiment, you select the group configuration to use. For example, you might want to run two different content experiments at different times during your course. In one content experiment, learners either see a video or complete a reading assignment. You can then include problems so that you can see which group learned the material more completely. For this content experiment, you need a group configuration that assigns your learners to two experiment groups. In the other content experiment, you can present the same question using four different types of problems. For this content experiment, you need a group configuration that assigns your learners to four experiment groups. The edX Platform assigns learners to each experiment group in a group configuration. Experiment group assignments have the following characteristics. The edX Platform assigns a learner to an experiment group the first time he or she views a content experiment that uses the group configuration. You cannot control which learners are assigned to which experiment group. The edX Platform keeps track of the size of experiment groups, and assigns new learners to groups evenly. For example, if you have two experiment groups in a configuration, each group includes 50% of the learners in the course; if you have four experiment groups, each group includes 25% of the learners. Learners remain in their assigned experiment groups regardless of how many content experiments you set up that use the same group configuration. You must enable content experiments before you can set up group configurations. 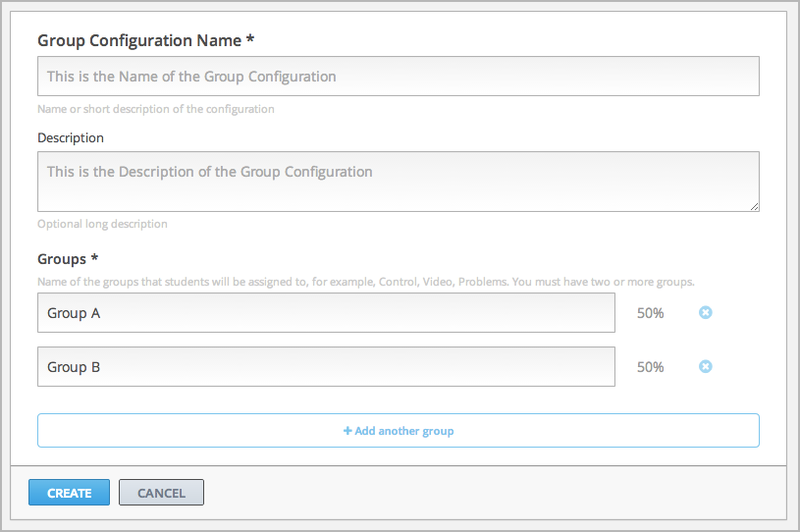 To set up group configurations, on the Settings menu, select Group Configurations. The Group Configurations page opens. From this page you can create, edit, and delete group configurations. You can also view content experiments that use a group configuration. You can create a group configuration at any time. Enter a name in the Group Configuration Name field. Use a meaningful name, because you will select from group configuration names when you create content experiments. Learners do not see the group configuration name. Optionally, enter a description for the new group configuration. By default, a new configuration already contains two groups. Modify the groups or add and delete groups as needed. A group configuration must have at least one group. Modify group names as needed. You see group names in the unit page in Studio, but group names are not visible to learners. Select Add another group to include another group as part of the configuration. Select the X to the right of an existing group to remove it from the configuration. A group configuration must have at least one group. Select Create to save the new group configuration. You can change the name of a group configuration at any time. However, before you modify any other characteristics of a group configuration that is currently used in a running course, review Guidelines for Modifying Group Configurations. On the Group Configurations page, hover over the group configuration and select Edit. On the Edit a Group Configuration page modify the name and description as needed. Modify groups in the configuration as needed. See Create a Group Configuration for details. Select Save to save your changes. You can only delete a group configuration that is not currently used in a content experiment. You cannot delete a group configuration that is used in a content experiment. On the Group Configurations page, hover over the group configuration and select the Delete icon. When prompted to confirm the deletion, select Delete. You can view the content experiments that use each of your group configurations. On the Group Configurations page, select the name of a group to see its details. You see links to the content experiments that use this group configuration. Select a link to go to the unit that contains the content experiment. When working with a content experiment, you can view details about the group configuration used by that experiment in two ways. In a unit that contains a content experiment, in the content experiment block, select the name of the group configuration. At the top of the content experiment page, select the name of the group configuration. In both cases, the group configuration opens. You can use the link in the group configuration to return to the unit that contains the content experiment. Review these guidelines if you must modify a group configuration after a course starts. These guidelines apply for courses built in Studio or using OLX (open learning XML). Change the id value of a group configuration. After the course starts, do not change the id value of an experiment group. You can change experiment group names at any time. After a course in which you are running a content experiment has started, learners in a specific experiment group might have difficulties with the content or with the course experience. 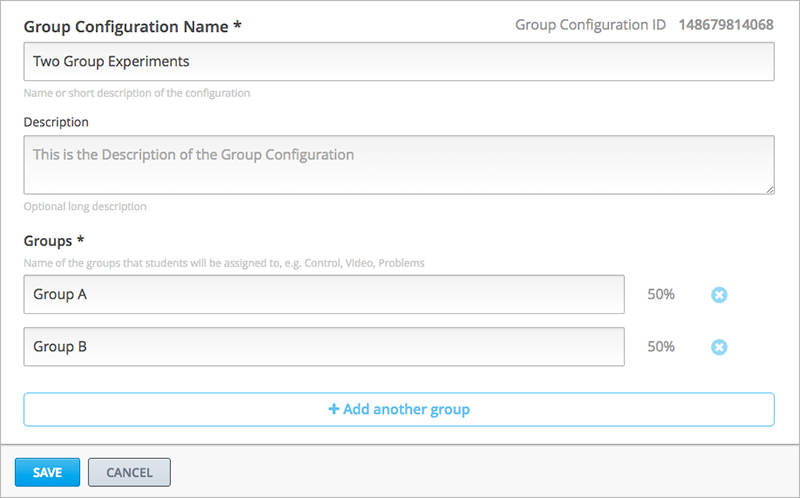 In this situation, you can remove the experiment group from the group configuration. Content that was specified for that experiment group is then no longer visible to learners. Learners in the removed experiment group are reassigned evenly to one of the other experiment groups in the group configuration. Any problems that these learners completed in the removed experiment group content do not count toward their grades. The learners must begin the problem set again and complete all the problems in the experiment group content to which they are reassigned. Removing an experiment group affects event data for the course. Ensure that researchers who are evaluating your course results are aware of the experiment group that you removed and the date on which you removed it. You define group configurations in the policy.json file in the policies directory of an OLX (open learning XML) course. To specify group configurations, you modify the value for the user_partitions policy key. user_partitions is the internal edX Platform name for group configurations. The value for user_partitions is a JSON collection of group configurations, each of which defines the experiment groups of learners. Use names for group configurations that are meaningful. You select from the list of group configuration names when you add a content experiment. See the following examples for more information. The following code shows an example JSON object that defines a group configuration with two learner segments. The "id": 0 identifies the group configuration. For XML courses, the value is referenced in the user_partition attribute of the <split_test> element in the content experiment file. The groups array identifies the experiment groups to which learners are randomly assigned. For XML courses, each group id value is referenced in the group_id_to_child attribute of the <split_test> element. The following code shows an example JSON object that defines two group configurations. The first group configuration divides learners into two experiment groups, and the second divides learners into three experiment groups. As this example shows, each group configuration is independent. Group IDs and names must be unique within a group configuration, but not across all group configurations in your course.